Carpathian Forest We're Going to Hell for This. Our Products >> CD'S >> Satanic Black Metal >> CARPATHIAN FOREST (norway) -Defending the Throne of Evil. 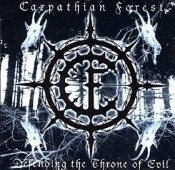 CARPATHIAN FOREST (norway) -Defending the Throne of Evil. 4. Put to Sleep Like a Sick Animal !! !